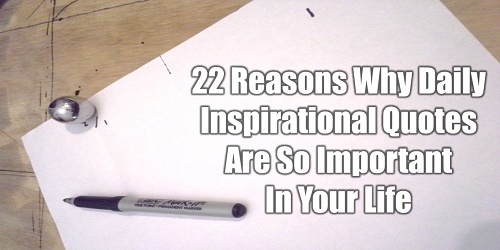 22 Reasons Why Daily Inspirational Quotes Are So Important In Your Life - Motivate Amaze Be GREAT: The Motivation and Inspiration for Self-Improvement you need! What can a simple Inspirational Quote do for me? How can a few words, in fact, change my life? Why the hell, are quotes going viral in social media? These are some of the questions people make about Inspirational Quotes. For the septic minds, Inspirational Quotes are a cliché, a form of common sense that does little to their lives. Common sense in fact can be pointless, if you don't make it "common practice". Actually that's also a major flaw of Inspirational Quotes, if you just read them and don't make them common practice they can also become pointless. Like many things in life this principle also applies: it's not what things are that counts, but how you make use of them! For others, Inspirational Quotes are a great contributor to their lives, these are those people that take full advantage of the quotes they read daily. How they use them, what they see in them, where they apply them, those are the main questions. We include ourselves in this category and can give you our point of view about it. Isn't this great? Imagine you can collect the knowledge one gained throughout a whole life in a short collection of quotes you can read in less then 5 minutes? Massive! You can search Inspirational Quotes on a single subject, and see different/similar views from different and accomplished people on the same subject. Grab that knowledge and make your own conclusions. You can't trust your memory all the time. A great Inspirational Quote that you like can be with you all the time (in a sheet of paper, your notebook, your smartphone), to serve you as a reminder. Some people who said the best Inspirational Quotes are already dead, others are alive but they're are not near like you can pick up the phone and call them. Either case, Inspirational Quotes can be your access to the mind of the most wise people that ever lived, even if you can connect with them. 5. "Thoughts Become Words, Words Become Actions, Actions Become Who You Are"
This is a quote...that represents the idea that thoughts can be put into words, and those words can be transformed into actions. Inspirational Quotes are thoughts put into words, therefore, they can make you take action shaping who you are. You believe in something, imagine if you find an Inspirational Quote that relates to those beliefs. This gives you that extra boost of confidence, it confirms what you think, makes you more self-assured. Our brain needs to be constantly stimulated, reading is the king when it comes to make your brain work. Daily Inspirational Quotes are a condensed way of reading, get that mind working. Feeling sad? Feeling down? What do you do? Eat? Drink? Smoke? Try an Inspirational Quote! When you're feeling down, you're focusing on a sad situation. Change your focus with a great quote, you can change from sadness to joy in no time, as an example. The art of repetition is a powerful tool to target your brain, you can built great patterns that create familiarity. Familiarity is essential to make you take action, even in an unconscious way. Look at advertisers and what they do to make you buy their products...you can do that to your own mind by choosing your own quotes and take the actions you want! If you need to write a great piece of content, Inspirational Quotes can be a great opener or closer of your ideas. Because of their power, they can strengthen or recapitulate your points of view. We all have our favorite authors, artists or famous people. You can pay homage to them by reciting and sharing they're own words in the Inspirational Quote format. One of the major success factors is consistency. Most people don't succeed because they only do work when they feel like it. To be consistent, you have to repeat and repeat time again. Inspirational Quotes exposure can bring you that repetition from a mindset stand point. You can send or recommend a great book everyday to a friend, but it's easy said than done. While an Inspirational Quote is easily shareable. In today's social networks it's fast and effective, take advantage of it. My life mission is...that's the whole point! You can read it in a second, you can use a Inspirational Quote that really represents your life mission in a second, and you can also create your own in minutes. The best part it's that they are short and condensed, no need to expose the idea for hours or days. A friend or your family can provide you the support you need, but they aren't available all the time. Inspirational Quotes are! They don't replace your friends or family, but they do a great job when no one to help is around and you need it. We are surrounded by information, some is great, most are distractions that separate us from our goals. Inspirational Quotes are one of the tools you can use to regain that focus you need to accomplish your life goals. They are short, precise, you don't waste too much time reading them and they are effective. Don't make it a drama, all the problems you may have someone has already lived them and came up with a solution for them. Most likely, they have written a solution or a clue to that problem, in a form of an Inspirational Quote. Search for it. Contrarily to other means of information, you don't need great resources to gain access to Inspirational Quotes. Free resources are everywhere, from public libraries filled with books to internet access available in most places. If you want you can get them easily, take advantage. In today's world networking and connections are essential. Inspirational Quotes can be a common ground to relate with others or to express a point of view. They can even be the "ice breaker" to reach an agreement. Hours of lecturing on a subject can be simplified by Inspirational Quotes. They make a great job compacting ideas, since you can compact many ideas into one quote, you can expose more ideas in one lecture or presentation than you previously could. Do you know the power that incantations can have to your life? If you repeat some programmed words everyday you'll target your subconscious mind in a conscious way, when the time comes you will start to unconsciously act according to what you've planned. The right Inspirational Quotes, that serve your goals, can be a form of incantation, they are easy to memorize and you can repeat them daily. Inspirational tools are things you can use to capture inspiration. Things that will motivate you and empower you to do what you need to do. You can use videos, speeches, meditation, books, music, or...Inspirational Quotes! For great Inspirational Quotes About Life visit our Quotes section in our website. Please share this article with your friends on social networks like Facebook, Twitter, Google Plus, Instagram, Pinterest, or the one you prefer using the buttons on the side or bellow.